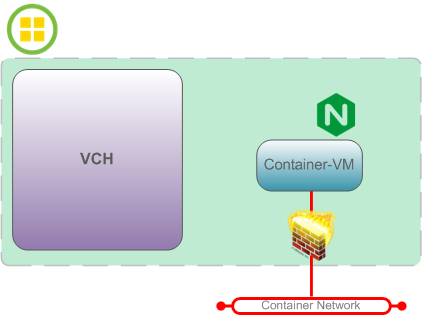 One of the unique and amazing features of vSphere Integrated Containers, VIC, is its ability to expose containers services directly on a network, which means the traffic would not need to pass through the container host (port mapping), full network throughput per container and outages at the container host DO NOT cause any outages to the container service itself. This capability is possible through the use of Container Network option. On traditional Docker implementation, you could just pass the option -P and all container’s exposed ports will be published, while it’s great, it also raises security concerns about publishing ports and services that you are unaware of and might, potentially, increase your attack surface. With that in mind, VMware, enhanced the security and control of container services with a new security feature, container network firewall, available starting from VIC 1.2. By default the behavior of container network firewall is Publish, that’s why -P option might suddenly stop working after you upgrade to VIC 1.2. Now you have all the control you need on your container’s services. 1. There is an additional "Outbound" option which is primarily intended for networks on which containers are consuming services, but not serving them. A primary example for that would be if a corporate database or the server for an NFS volumeStore is accessed over a specific network.